I am a big jewellery lover. Always have been, always will be. (Despite the fact I will never be able to get my head around how you spell it…)! I love treating myself to little jewellery pieces. Buying yourself a new pair of earrings is the answer to everything! I can never not wear my jewellery either, I definitely think it makes an outfit. 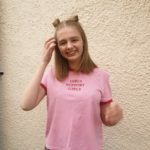 So for this post I wanted to share my current favourite pieces of jewellery. 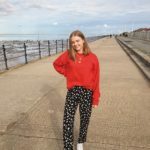 From a small selection of brands that I truly adore! All affordable and gorgeous so they tick all my boxes. 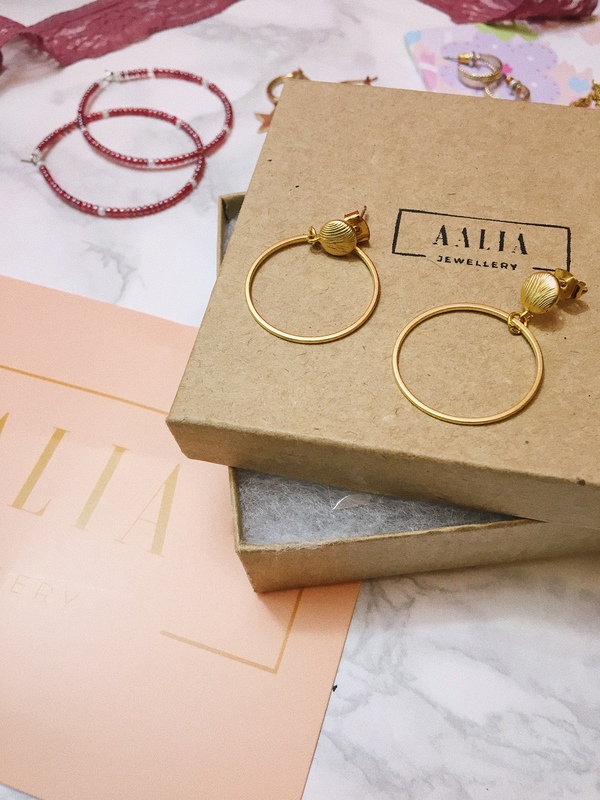 Recently I was very kindly sent these stunning earrings from Aalia Jewellery and I’m so so grateful as they’re honestly so beautiful. I wear a hoop in my ear everyday when I’m not in school… I love my hoop earrings! The earrings have a simple thin gold hoop which is the perfect size. Not too big, not too small, it’s just right! (The true Goldilocks in the earring department)! And the hoop is handing from a small textured circle stud. I love this design as the stud is prominent on your ear so gives that extra bit of detail than just wearing a normal hoop earring. The earrings themselves are such good quality and I think are so affordable for the fabulous quality you get. And they’re lightweight which I’m so thankful for as I hate the feeling of wearing heavy earrings. I can’t feel these when wearing whatsoever which is a big thumbs up from me! The earrings arrived in quickly in gorgeous packaging so would for sure make the perfect gift (to yourself or to someone else)! 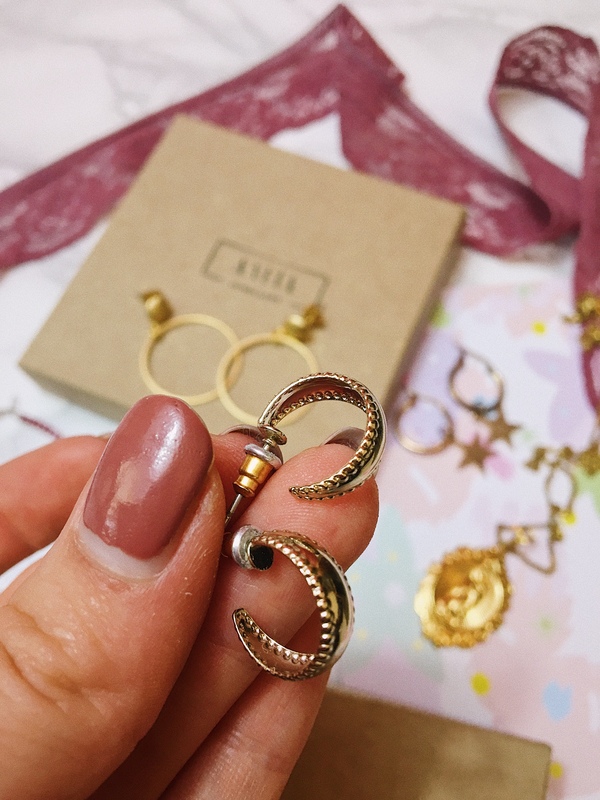 I would definitely recommend Aalia Jewellery as I’ve fell in love with these earrings. And over on their store they sell many other earrings, chokers, bracelets, anklets and even gorgeous hand chains! And they’re all handmade which is truly fantastic! Use the code ‘INSTA10‘ for 10% off your first order! The one and only Yossy from withloveyossy.com recently launched her brand, Foaki . A fabulous jewellery brand that sells the “latest accessory trends whilst leaving your bank account in a decent state“. I’ve been obsessed with her and her blog for so long. She is the kindest girl ever and is so incredibly lovely. So of course when Foaki went live I was straight away placing an order! 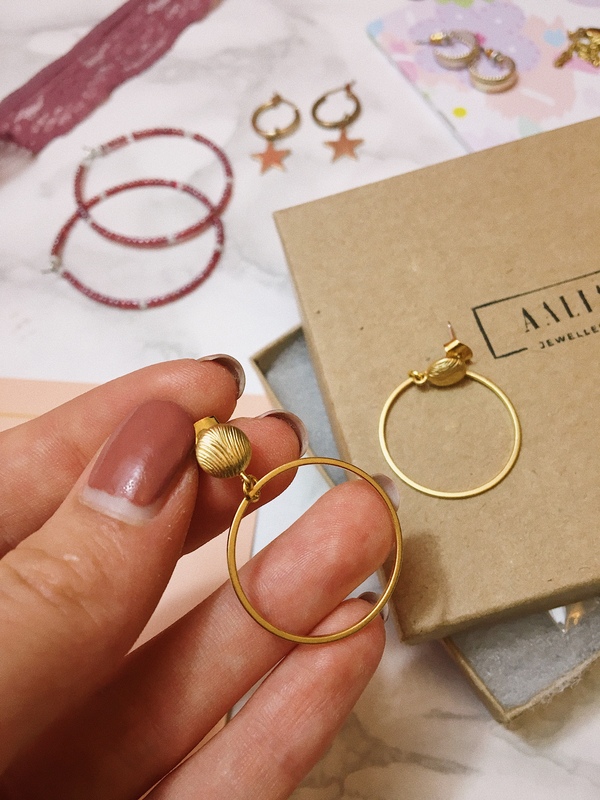 I bought a pair of the Emiola earrings which are a pair of small hoops with a dangling star in a dusty gold shade. These earrings are so so gorgeous and look so cute when wearing. I love the design of these and were such a bargain as I’ve gotten so much wear out of them and much more to come! I don’t often look in Topshop at their jewellery but I got drawn in when waiting to pay… always the way! But I’m so chuffed that I bought these. They’re 1cm gold hoops that are engraved around the edge so are so dainty and stunning. Although they’re small, they’re quite wide so are noticeable when wearing. I’ve been living in these as they’re perfect to wear day to day. I was pleasantly surprised at the quality of these hoops as well. So I shall definitely be looking at Topshop’s jewellery more, (dear bank account, I’m sorry). 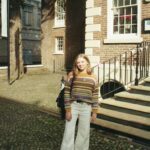 If you’re looking for some affordable and ‘quirky’ earrings then Depop will be your pot of gold. 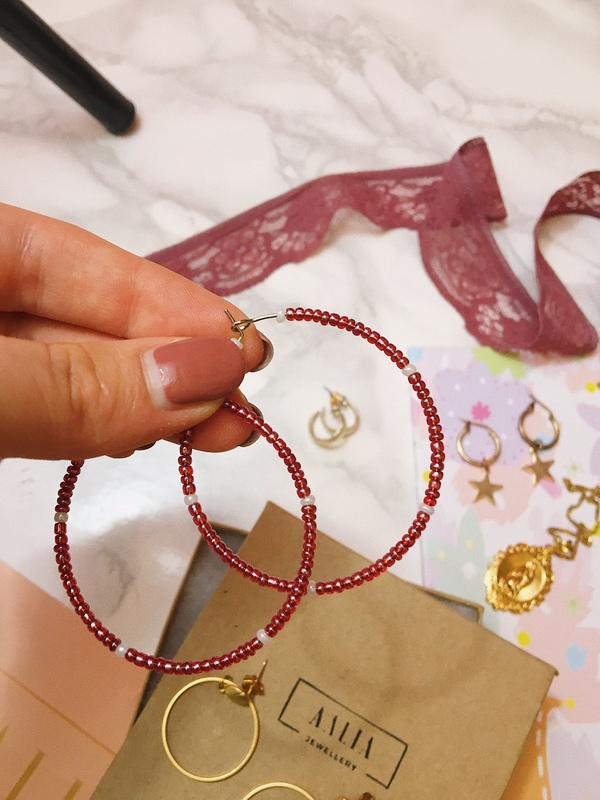 I bought these red bead hoops from ‘Bigger The Hoop‘ on Depop. I feel like these won’t be everyone’s cup of tea but I adore them. They’re really simple but I love wearing them. I would for sure recommend Depop for earrings as these are fab quality and I cannot fault anything with them! What’s your favourite piece of jewellery or brand at the moment? 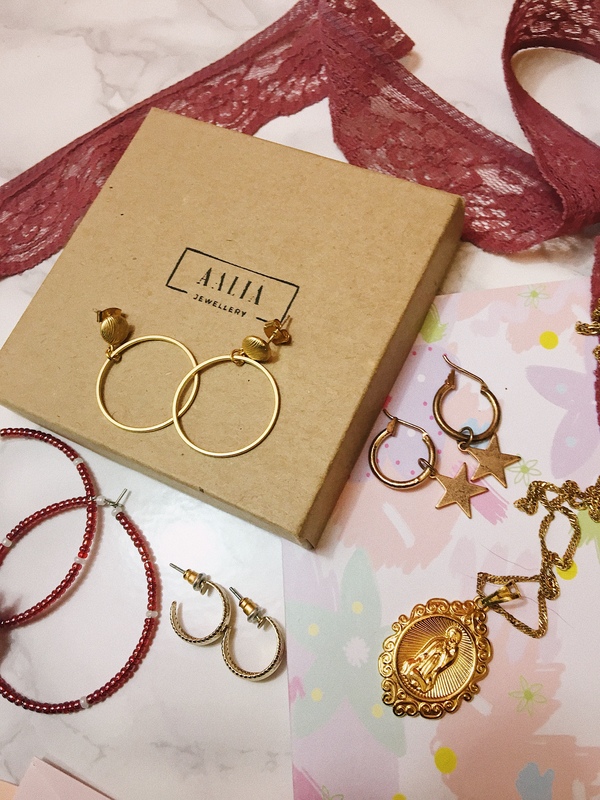 Absolutely love those Aalia hoop earrings! Gorge! 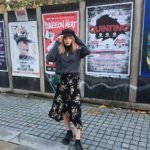 Love how you are sharing the love of small companies in this post and these jewellery pieces look so unique and cool! Great post! I really don’t wear my jewellery enough but this has definitely motivated me to over the summer! Some really pretty earrings, I do love Topshop when it comes to affordable jewellery!